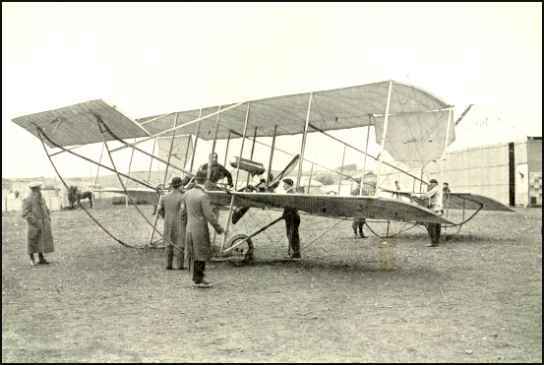 via email from Dave Lam, 8-14-04 In 1909, he reportedly took Gertrude Bacon on a flight, making her the first Woman in England to fly in an airplane. Of more importance to me, since I am working on a biography of Marie Marvingt, is that he was the one who gave her the "baptism of the air" at Nancy/Jarville in September 1909. ONLINE RESOURCES Using the Google search engine on "Roger Sommer", you will find about 224 links. If you use "Roger Sommer" +aviation, you will find about 40 links. About half of them are in French, but a machine translation is usually available. Via email from Jim Lambert I have very little on Sommer, I know that his license to fly was in the very low numbers, possibly # 4 or 5 , that is in France. I know that he lived to a good age, I believe that he died in the early 1970s. I know that his son was a very famous car racing driver who was killed in the French Grand Prix in the 1950s. He was a designer of several aircraft, two monoplanes and three bi-plane types, I know that he worked as an aicraft designer for the Humber company in England. I think that this man's humility, prevented his inclusion in history, I think that his story, if it can be uncovered, via the internet, will prove to be an interesting one. 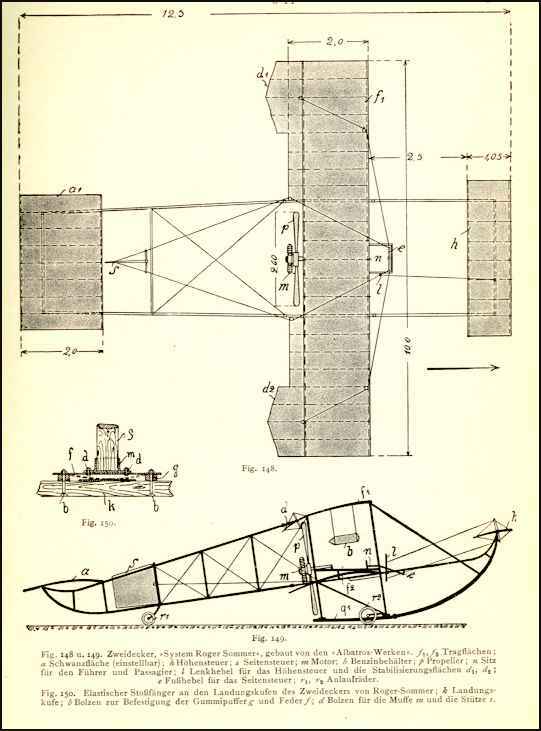 As an example, it seems that the Cierva autogyro, used a Sommer monoplane fuselage, including the Le-Rhone rotary, so some missing links may be connected. 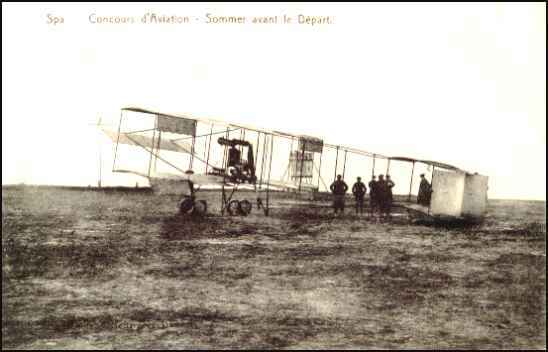 On a visit to the Jean Salis aerodrome south of Paris in 1999 ( to fly my 1/3 scale Blackburn monoplane) I was told of Sommer whilst chatting with the pilot of a full size Bleriot replica. I am almost at the completion of a 1/4 full size radio controlled flying replica of Sommer mono, using material supplied by Arizona Scale Aircrafters. I will send you a copy of the small but reasonably detailed original Sommer drawing which they sent me. 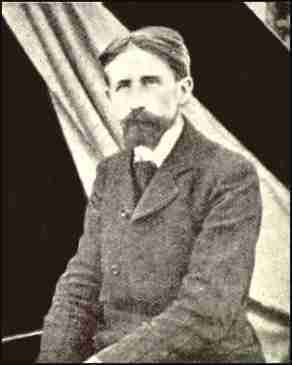 His French License Was # 29, 15 Jan 1910. 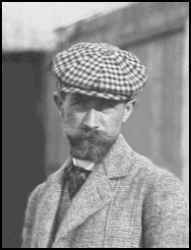 He was born 4 Aug 1877 at Pierrepont. for the "Quinzaine of the Aviation. Sedan-Douzy (LFSJ) Northern France next to Reims. 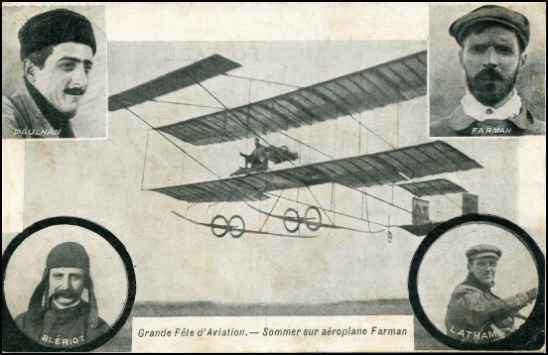 Roger Sommer, while testing a monoplane built by him today, tried to glide, and when landing fell and was dangerously injured. I think you will want to browse the entire exhibit, page by page. I found it to be a very valuable addition to the online community. 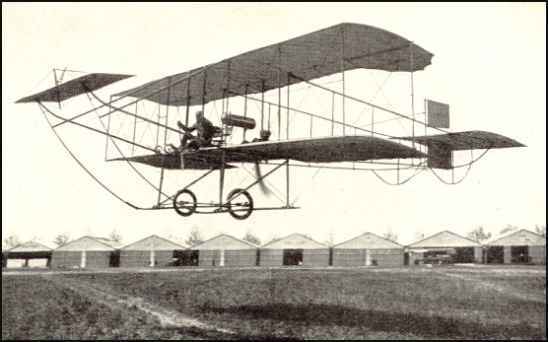 The recent performance of the Sommer monoplane, piloted by Bathiat, has directed the attention of designers to this machine, the particulars of which are as follows: Spread, 29 feet 21/2 inches, with a length over all of 24 feet. The area of the main planes is 172 square feet. The weight of the machine in flight order, less pilot and supplies, is 570 pounds; when fitted with a 50-horsepower Gnome the total useful load is about 440 pounds, making the total load over 1,000 pounds. This gives a loading per square foot of 5.8 pounds. It was in a machine of this type, but slightly reduced, that Bathiat made his world's record for 200 and 300 kilometers, using a 70-horsepower Gnome motor. The speed attained being in excess of 93 miles per hour. 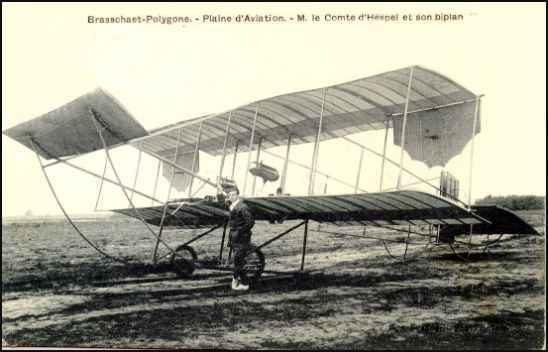 There is a small museum, Le Musée des Débuts de l'Aviation, with a copy of his 1910 biplane in the village of Douzy, and many 1/4 models, near Sedan, in north-eastern France. The museum offers for sale a short biography of Roger Sommer which I wrote many years ago. I am sorry, but I do not know at what price. AltaVista Babel Fish Translation Copy and enter "www.chez.com/cybergaume/3cantons/musees.html" into the proper place, select "French to English" translation, and click on "Translate." You will find the entry for The Museum of the Beginnings of Aviation about half way down the page. You will see a picture of the replica of Sommer's plane. In the summer of 1999 I spent a holiday in Northern France, which we chose then because the Moon's shadow would pass over us in that period. We have visited the little Roger Sommer museum near Douzy, admiring the beautifully built replica of Sommer's machine. It is the one with the rounded ailerons. Fascinating was the enormous postcard collection displayed there. 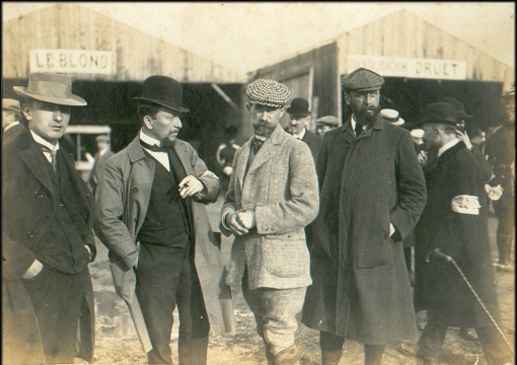 It showed how the general public was involved in the aviation demonstrations at Reims and other places..
What you don't mention is the famous family that Roger Sommer descended from. He's from the village of Mouzon, 10 km South-East of Douzy. The Sommer factory produces felt in all varieties. I was familiar with the name before that holiday, but was surprised to see that Mouzon has an interesting felt museum. We went there after discovering that "feutre" means felt. You learn how felt is being made and that it has more applications than you can imagine. 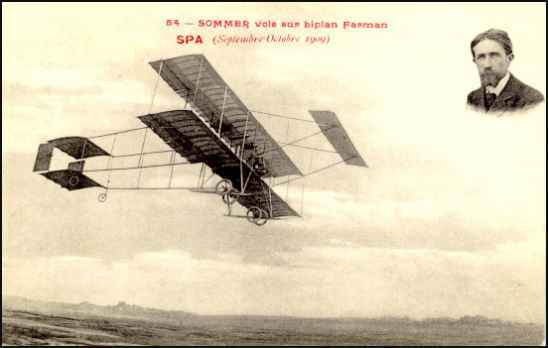 The Sommer family was rather disappointed that Roger went into something as stupid as aviation, but he returned after the World War and modernised the manufacture. Roger Sommer died in 1965.